No one seems surprised at all. Was anyone really dumb enough to believe it? LOL. You are displaying your ignorance of economics again by quoting those who either have an agenda or are ignorant themselves. One excuse after another. That's how it works. No one really expected those promises to be honest ones. "Oh, we didn't tell you. What we promised won't happen because... Did you really believe what we said?" Well, let's look at what the president of the Minneapolis Fed said on this issue. Kashkari, who is the president of the Minneapolis Fed, points to the lack of significant upward pressure on wages as evidence debunking the claims that the U.S. lacks workers. The logic is pretty simple: if the supply of labor is so limited relative to demand, the price of labor should be swiftly rising. The fact that the price of labor is not rising much suggests that perhaps labor is not in as short supply as some employers and special interest lobbying groups claim. Maybe these claims of a labor shortage are just covers for those who want U.S. labor costs to fall, which would raise profits in the short term. Another theory is that labor prices have become stuck at low levels because employers, after so many years of high unemployment and minimal wage pressure, have become reluctant to raise wages. The tool of offering higher wages to attract new workers has fallen out of the toolkit of many American businesses and no one noticed because it wasn’t needed for so long. But now that there are far fewer unemployed people desperately hoping for a job, employers do not know where to turn to find new employees. They’ve forgotten how to poach workers from competitors with higher wages. The rest of the article can be found at the following link. LOL. He who lives in a glass house ought to be smarter than to throw stones. Let's take a look at all the promises the democrats have made in their "war on poverty" which has overseen a tremedous rise in poverty and the destruction of the black family, shall we? Let's look at before and after statistics of marxist policies and see what what they really caused. You have decades of lying to account for. You have decades of failed policies to make excuses for. You have trillions of dollars worth of spending to make excuses for. So Trump didn't think so many people would re-enter the job market. For that you call him a liar. Well, account for all the lies of the democrats for more than 5 decades. Nothing they have promised has come true. Things have only deteriorated so that the situation is now many times worse than it was. Trump's so-called lies have left a status quo for the moment. Democrat lies have left a 5+ decade history of total and complete failure. Nothing they said would happen has come true, and the situation is now far worse than when they started. I'm keeping more of my own money and you hate that don't you? LOL. He who lives in a glass house ought to be smarter than to throw stones. Yep. The republicans were critical of the seven-year growth in wages, because it wasn't "big enough", and then when they get their chance, it falls flat. The promised wage growth didn't materialize. And now, they're making excuses. Let's take a look at all the promises the democrats have made in their "war on poverty"
...which has overseen a tremedous rise in poverty and the destruction of the black family, shall we? Yes, some referred to Bush's economic program as the "war on the poor." He managed to bring the poverty rate up considerably. So Trump didn't think so many people would re-enter the job market. For that you call him a liar. Everyone admits he's a liar. But I didn't call him out for that particular lie. Would you like to see a list of his documented lies? If your Marxist tax revision didn't provide the promised wage increases, maybe that's a wake-up call for you. Here's a video by Thomas Sowell. He and Walter E. Williams are two of the pre-eminent black authors of the last few decades. Both are economists, both came out of the projects, and both decry the marxist policies of the welfare state as having led to the destruction of the black family. Both are glad that they went through school before affirmative action was put in place. They credit the lack of affirmative action for their success in life. Here is Thomas Sowell on what welfare policies actually do. For anyone who really wants to understand these issues I would recommend Thomas Sowell's books. One book I recommend because I own it would be The Economics of Politics and Race, and another would be Civil Rights: Rhetoric or Reality. These books show exactly how destructive the welfare state is, and how many fallacies marxists create to support their baseless assertions. I have several of Thomas Sowell's books and they all have many pages of footnotes which document the things he says. Anything Thomas Sowell asserts he documents with evidence from other sources. Here is an article by Sowell titled A Legacy of Liberalism. The South long remained a region that blacks fled by the millions -- for very good reasons. But, in more recent years, the net migration of blacks has been from the North to the South. No doubt they have good reasons for that as well. Here is an article by Walter E. Williams on welfare. Walter E. Williams on government subsidizing bad behavior. Walter E. Williams, Up From the Projects. William's commentary on discrimination, affirmative action, civil rights laws, and other hot button topics, is excellent. He destroys the marxist agenda. 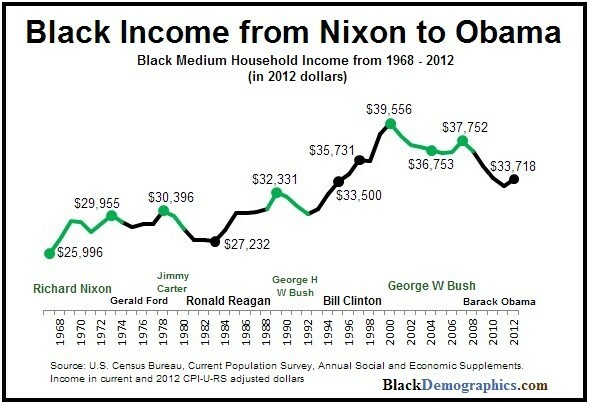 As you see, real income for blacks has increased markedly over the years. This is what has Sowell and Williams so upset. Except for Bush's Great Recession, it's been a general pattern of income increase. To give Affirmative Action all the credit is misplaced, however. The right is understandably shaken by the economic rise of black citizens, but Affirmative Action, in my opinion, is not the primary cause. You need to think about this a little more carefully, and forget your Marxist theories. LOL. Oh, I love this. You're so ignorant of economics it's not funny. Your graph shows what? An increase of approximately 33% over a 44 year span. That's an approximate increase in income of .75% per year. That's right. Only 3/4 of 1 percent growth per year. Whoopee. What a deal. Do you know what inflation averaged over that same time span? 4.38%. That's right. They lost approximately 3.63% of their income every year over a span of 44 years to inflation. In other words, barby, they were far poorer at the end of that 44 year span than they were at the beginning of it. Prices went up, in that time span, 559.8%. Oh, yeah. What a great demonstration of the building of wealth.... It took $659.80 of 2012 dollars to buy what $100 of 1968 dollars bought back in 1968. Oh, it was such an increase in their standard of living. In other words, barby, if someone earned $5000 in 1968 to equal that buying power in 2012 they had to earn $32,990 in 2012. That's only about a 75% loss in purchasing power over those 44 years. Yippee skippy. What a great thing marxist encomic policies are. Let's dance. We're all getting rich. Well, you know what economic ignoramuses barbarians are. Let's see what's irritated you so much, this time. Notice that those aren't inflated dollars. They are in constant 2012 adjusted dollars. You didn't read the data on the chart. Ooops. Apparently, someone was an ignoramus, but it wasn't the Barbarian this time. What a great thing marxist encomic policies are. Your Marxist economics let you down on this one. Go back and see if you can figure it out. LOL. Let's say I give you your assertion. 100% of it. That is still only an increase of income that averages 3/4 of 1 percent per year. Wow. What a net positive. And you point to that as a big success. That's a failure in anyone's book, but yours. An economy that only grew 3/4 of 1 percent a year is considered to be the next thing to a recession. It's called stagnation. Economic stagnation. Personal income that only grows 3/4 of 1 percent per year is also stagnation. Economic stagnation. To have it grow like that over a 44 year time span is a total failure. According to the rule of 72 a 2% yearly increase over a period of 36 years doubles the starting amount. By that same rule a 3% increase per year doubles the base amount in 24 years. Your time span covered 44 years and didn't come even close to doubling the base amount. It's. Total. Economic. Failure.